Large differentials in cigarette taxes across states create incentives for black market sales. 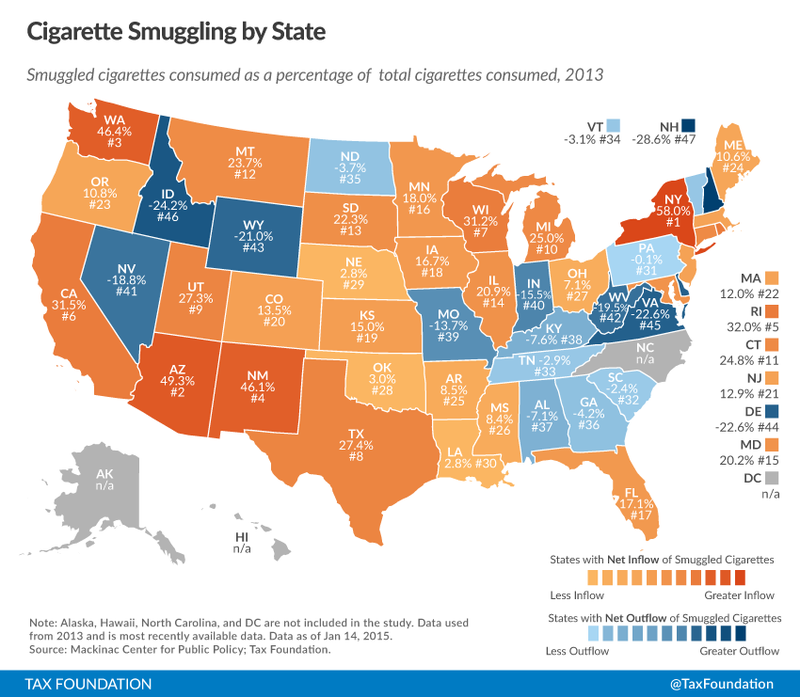 Smuggled cigarettes make up substantial portions of cigarette consumption in many states, and greater than 20 percent of consumption in fifteen states. The highest inbound cigarette smuggling rates are in New York (58.0 percent), Arizona (49.3 percent), Washington (46.4 percent), New Mexico (46.1 percent), and Rhode Island (32.0 percent). The highest outbound smuggling rates are in New Hampshire (28.6 percent), Idaho (24.2 percent), Virginia (22.6 percent), Delaware (22.6 percent), and Wyoming (21.0 percent). Smuggling rates jumped substantially in Illinois after hikes in state and county excise tax rates, from 1.1 percent of consumption in the last edition to 20.9 percent in this edition. Cigarette tax rates increased in 30 states and the District of Columbia between 2006 and 2013. Public policies often have unintended consequences that outweigh their benefits. One consequence of high state cigarette tax rates has been increased smuggling as criminals procure discounted packs from low-tax states to sell in high-tax states. Growing cigarette tax differentials have made cigarette smuggling both a national problem and a lucrative criminal enterprise. Each year, scholars at the Mackinac Center for Public Policy, a Michigan think tank, use a statistical analysis of available data to estimate smuggling rates for each state. Their most recent report uses 2013 data and finds that smuggling rates generally rise in states after they adopt large cigarette tax increases. 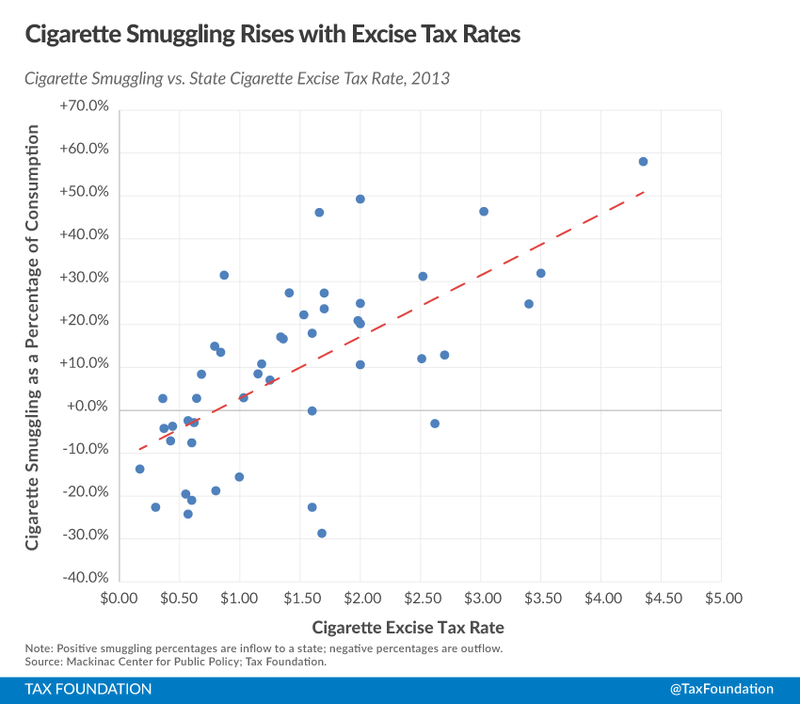 Smuggling rates have dropped in some states, however, often where neighboring states have higher cigarette tax rates. Table 1 shows the data for each state, comparing 2013 and 2006 smuggling rates and tax changes. New York is the highest net importer of smuggled cigarettes, totaling 58.0 percent of the total cigarette market in the state. New York also has the highest state cigarette tax ($4.35 per pack), not counting the additional local New York City cigarette tax (an additional $1.50 per pack). Smuggling in New York has risen sharply since 2006 (+62 percent), as has the tax rate (+190 percent). Smuggling in Illinois has also increased dramatically, from 1.1 percent to 20.9 percent since the last data release. This is likely related to the fact that the Illinois state cigarette tax rate was hiked from $0.98 to $1.98 in mid-2012. This increase in smuggling may continue in future data editions, as more recent increases in both the Cook County rate (from $2.00 to $3.00 per pack, effective March 1, 2013) and the Chicago municipal rate (from $0.68 to $1.18, effective January 10, 2014) have brought the combined state-county-municipal rate to $6.16 per pack of cigarettes, the highest combined rate in the country. Other peer-reviewed studies provide support for these findings. Recently, a study in Tobacco Control examined littered packs of cigarettes in five northeast cities, finding that 58.7 percent of packs did not have proper local stamps. The authors estimated 30.5 to 42.1 percent of packs were trafficked. Smuggling takes many forms: counterfeit state tax stamps, counterfeit versions of legitimate brands, hijacked trucks, or officials turning a blind eye. The study’s authors, LaFaive and Nesbit, cite examples of a Maryland police officer running illicit cigarettes while on duty, a Virginia man hiring a contract killer over a cigarette smuggling dispute, and prison guards caught smuggling cigarettes into prisons. Policy responses have included banning common carrier delivery of cigarettes, greater law enforcement activity on interstate roads, differential tax rates near low-tax jurisdictions, and cracking down on tribal reservations that sell tax-free cigarettes. However, the underlying problem remains: high cigarette taxes that amount to a “price prohibition” of the product in many U.S. states. Source: Mackinac Center for Public Policy; Tax Foundation. See, e.g., Mackinac Center for Public Policy, Michael LaFaive, Todd Nesbit, & Scott Drenkard, Cigarette Smugglers Still Love New York and Michigan, but Illinois Closing In (Feb. 2015), http://www.mackinac.org/20900; Mackinac Center for Public Policy, Michael LaFaive, & Todd Nesbit, Cigarette Smuggling Still Rampant in Michigan, Nation (Feb. 2014), http://www.mackinac.org/19725; Mackinac Center for Public Policy, Michael LaFaive, & Todd Nesbit, Higher Cigarette Taxes Create Lucrative, Dangerous Black Market (Jan. 2013), http://www.mackinac.org/18128; Mackinac Center for Public Policy, Michael LaFaive, Cigarette Taxes and Smuggling 2010: An Update of Earlier Research (Dec. 2010), http://www.mackinac.org/14210; Mackinac Center for Public Policy, Michael LaFaive, Patrick Fleenor, & Todd Nesbit, Cigarette Taxes and Smuggling: A Statistical Analysis and Historical Review (Dec. 2008), http://www.mackinac.org/10005. The Civic Federation, Higher Tax Rates in Effect for Chicago Tobacco Consumers (Jan. 2014), http://www.civicfed.org/civic-federation/blog/higher-tax-rates-effect-chicago-tobacco-consumers. 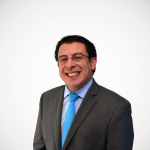 See, e.g., Michael F. Lovenheim, How Far to the Border? : The Extent and Impact of Cross-Border Casual Cigarette Smuggling, National Tax Journal, Vol. LXI, No. 1, (March 2008). http://ntj.tax.org/wwtax/ntjrec.nsf/BF515771548F9D538525742E006CCBBA/$FILE/Article%2001-Lovenheim.pdf; R. Morris Coats, A Note on Estimating Cross Border Effects of State Cigarette Taxes, National Tax Journal, Vol. 48, No. 4, (December 1995), pp. 573-84, http://ntj.tax.org/wwtax/ntjrec.nsf/notesview/D7AF38C6EF8BF6D7852567EF0057A8C0/$file/v48n4573.pdf; Mark Stehr, Cigarette Tax Avoidance and Evasion, Journal of Health Economics, Vol. 24, (2005), pp. 277-97, http://legacy.library.ucsf.edu/documentStore/h/j/o/hjo10j00/Shjo10j00.pdf. Kevin C. Davis et. al., Cigarette Trafficking in Five Northeastern US Cities, Tobacco Control, December 2013, http://tobaccocontrol.bmj.com/content/early/2013/12/11/tobaccocontrol-2013-051244. See, e.g., Scott Drenkard, Tobacco Taxation and Unintended Consequences: U.S. Senate Hearing on Tobacco Taxes Owed, Avoided, and Evaded, Tax Foundation, July 29, 2014, https://taxfoundation.org/article/tobacco-taxation-and-unintended-consequences-us-senate-hearing-tobacco-taxes-owed-avoided-and-evaded. See, e.g., Curtis Dubay, UPS Decision Unlikely to Stop Cigarette Smuggling, Tax Foundation Tax Policy Blog, Oct. 25, 2005, https://taxfoundation.org/blog/ups-decision-unlikely-stop-cigarette-smuggling. See, e.g., Gary Fields, States Go to War on Cigarette Smuggling, Wall Street Journal, Jul. 20, 2009, http://professional.wsj.com/article/SB124804682785163691.html?mg=reno64-wsj. See, e.g., Mark Robyn, Border Zone Cigarette Taxation: Arkansas’s Novel Solution to the Border Shopping Problem, Tax Foundation Fiscal Fact No. 168 (Apr. 9, 2009), https://taxfoundation.org/article/border-zone-cigarette-taxation-arkansass-novel-solution-border-shopping-problem. See, e.g., Joseph Henchman, New York Governor Signs Law to Tax Cigarettes Sold on Tribal Lands, Tax Foundation Tax Policy Blog, Dec. 16, 2008, https://taxfoundation.org/blog/new-york-governor-signs-law-tax-cigarettes-sold-tribal-lands. 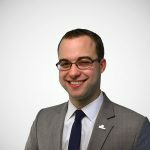 See Patrick Fleenor, Tax Differentials on the Interstate Smuggling and Cross-Border Sales of Cigarettes in the United States, Tax Foundation Background Paper No. 16 (Oct. 1, 1996), https://taxfoundation.org/article/tax-differentials-interstate-smuggling-and-cross-border-sales-cigarettes-united-states.